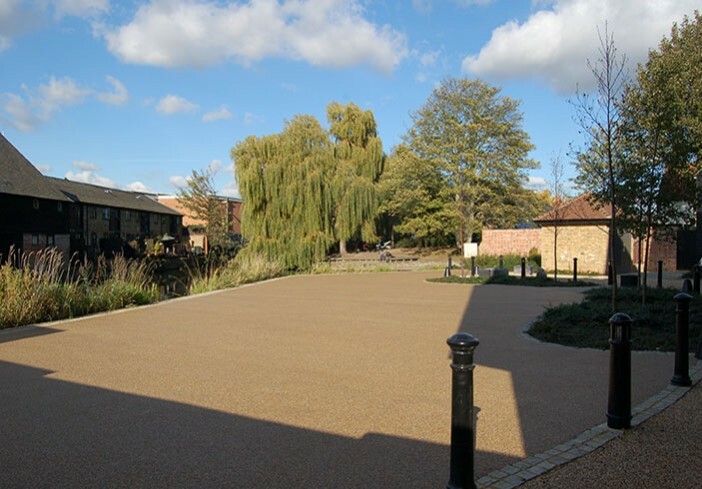 Free draining resin bound paving development has provided the ideal solution for an innovative building project in the county town of Hertford – modern technology that is perfectly at home in a conservation area. 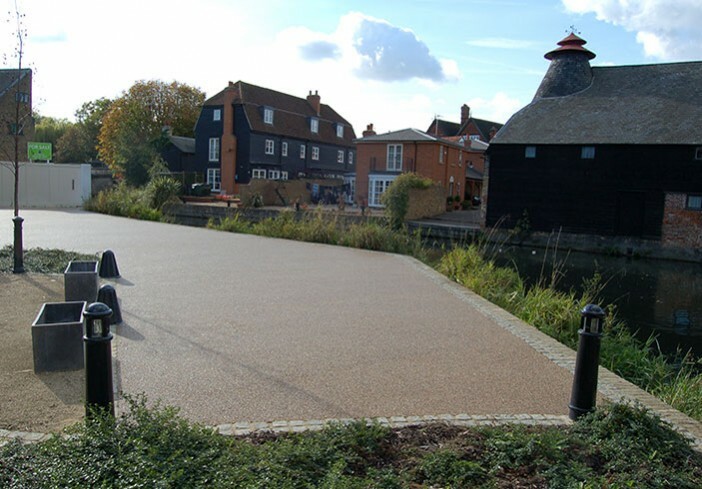 Project summary: With a unique development in the centre of Hertford nearing completion, groundwork contractor David White of White Contracting Limited in Hertfordshire needed to source a company that could provide an attractive, porous ground surface for the finishing touch – a park bordering the River Lea. Dolphin Yard is a state-of-the-art development that includes 16 apartments, a public library and the park. 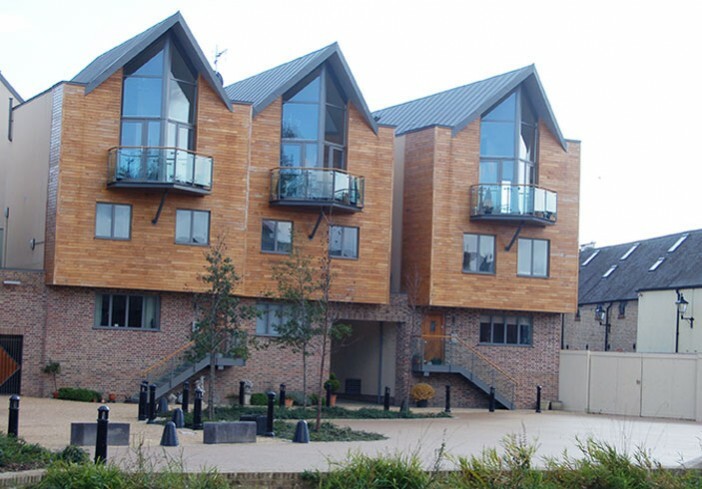 The high level specification has attained Level 3 of the Sustainable Homes Code and yet is coupled with the use of traditional building techniques such as brick and block walls and wide lime mortar joints, to reflect the building style of this historic town. The architect had specified resin bound paving be integrated into the driveway designs, something David had not utilised before. 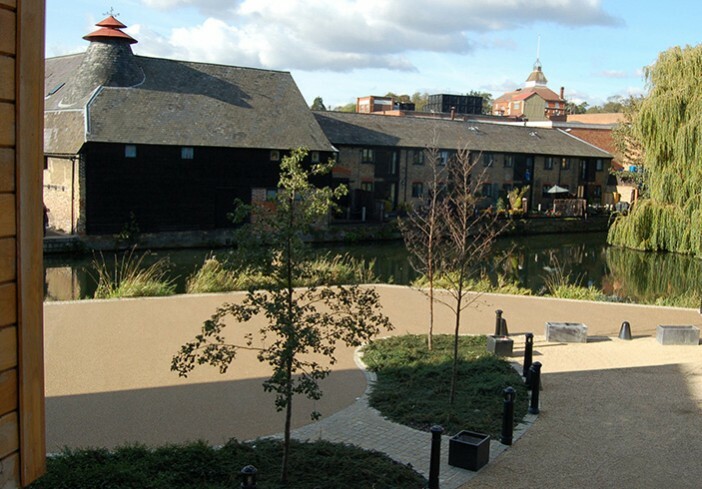 “Since the development is adjacent to the River Lea – literally one metre away – Hertfordshire County Council wanted a porous surface in case of flooding and had already approved resin bound paving. So I did some research on the Internet and found Clearstone,” says David. From the get-go David found Clearstone to be competitive, efficient and professional – the latter especially significant since several of the apartments were already occupied and work would need to be done with consideration towards the homeowners. It took the Clearstone team just two days to lay the resin bound paving on the 310 m2 area. And, once laid, it was ready immediately for pedestrians to stroll and admire the views of the River Lea. Dolphin Yard residents are “extremely pleased” with the look says David and commented on the professionalism of the Clearstone groundworks team during the building process. Project: Dolphin Yard is a state-of-the-art development that includes 16 apartments, a public library and the park. Area: Installed area 310 m2, laid at a thickness of 18mm.